Samsung has introduced many handsets in the low end segments and you will be amazed to see that all are branded in the Galaxy series and are Android based handsets. With the minute price difference, the company has managed to keep the good impression among user community even with few minor changes in look and feel in most of their handsets. We can take a look at the Galaxy POP S5570 and Fit S5670. In terms of display FIT comes in 3.3 inches TFT touch screen display with resolution of 240X320 and is also equipped with Accelerometer, whereas POP S5570 comes with slightly smaller screen of about 3.14 inches and it also has the Accelerometer. Display of both handset support 16 M colors and comes with proximity sensor. If we talk about the Camera, Galaxy FIT is equipped with 5 MP camera and it capture the snaps at 2560X1920 pixels as compared to Galaxy POP which has 3.15 MP camera and it capture pictures at 2048X1536 pixels. Both the cameras support GEO tagging. Even the frame per second of both the camera is also same: 15 frames/sec. Secondary camera is absent in both the handsets. FIT comes with 160 MB of internal memory and support to microSD up to 32 GB, on the other hand Galaxy POP has 160 MB and it also supports 32 GB external memory via microSD card. Both the handsets come with 2GB card in the box. Both the handsets have compatibility to HSDPA bands 900 and 2100 and it give max speed up to 7.2 Mbps. Both phones also have WI-FI supporting 802.11n and even the older versions. GPS is available in both mobile phones and Bluetooth 2.1 provided you better connectivity to PC and other Bluetooth device. WI-FI hotspot features are also available with both the Android 2.2 based handsets. In terms of UI, Samsung TouchWiz UI is part of both the phones giving better user experience on Anroid 2.2. 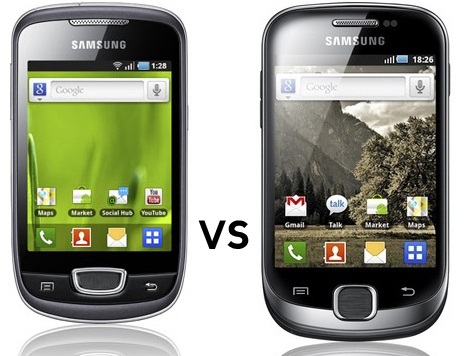 Both phones are even can be upgraded to Android 2.3. Processing speed of Galaxy FIT S5670 and POP is same, which is 600 MHz. Galaxy FIT has a 1350mAh battery which runs 642 Hrs on standby and 11 Hrs talk time on 2G. Where as, POP has smaller battery of 1200mAh and it runs for 570 Hrs on standby and support 9 Hrs of Talk time on 2G. On summarizing all the above discussed aspects, FIT S5670 has better camera, slightly bigger screen and better battery support. And it is highly recommended to add few more bucks to the cost of POP S5570 and to go for Galaxy FIT.